Today's customers are aggressively seeking products that contain simple, easy to recognize ingredients that are close to nature. Yet color and appearance are critical factors in consumer choice. How to reconcile the two? Actually, the two forces are creating unprecedented demand for natural colorants that can withstand the rigors of modern processing. Changes in food regulation also affect coloring trends. In Europe, regulatory limits on using artificial color have created a huge demand for natural colors, especially the reds, as evidenced by the wealth of negative publicity leveled against FD&C Red 40. The popular colorant has been blamed for everything from hives to hyperactivity to autism in children. According to investigations by Rajesh Cherian, the lab manager for Roha USA Ltd., St. Louis, colors can alter a consumer's perception of taste and palatability of a food or beverage. But trends in food colors are, more often than not, driven by trends in food flavors, consumer preferences and legislative guidelines. Despite the increased demand for colors derived from natural sources, in the U.S., at least, there has been no decrease in the use of artificial colors. "This has remained consistent," notes Tony Valenti, Roha's marketing coordinator, "and we expect that trend to continue." "My most frequently heard question is, 'Is caramel color natural?' " says Brian Sethness, of Sethness Caramel Color Co., Lincolnwood, Ill. "Although there is still no legal definition of 'natural,' numerous customers, including some of the world's largest food companies and natural products retailers, utilize caramel colors to color their 'all-natural' products." Caramel colors are appealing because they are GRAS, and they can simply be labeled "caramel color" or "caramel" on product labels. Moreover, since caramel color is a single color additive, its compositional constituents need not be listed. The formulation or revision of regulations to govern the quality and safety of food is an ongoing effort. Academia, trade groups, and consumer groups all contribute information and opinion to the process. A recent study, published in the Journal Food and Chemical Toxicology suggests that FD&C Blue #1 (Brilliant Blue FCF, E133) and Patent Blue V (E131, not permitted for food use in the U.S.) could disrupt cell metabolism when they are absorbed into the bloodstream. The researchers, based at the Slovak University of Technology, suggested candy makers stop using these colors as they might pose a health risk to children. It's worth noting that in 2010 the European Food Safety Authority (EFSA) re-evaluated the safety of Brilliant Blue. Its response to the re-evaluation was to adjust the acceptable daily intake (ADI) to 10 mg/kg bw/day. The ADI for Patent Blue is 15 mg/kg bw/day. The use of Patent Blue V in food has been banned in the U.S. and Australia due to concerns that it may cause allergic reactions. 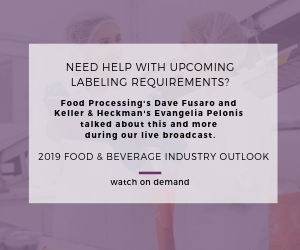 More recently, Class I or Plain Caramel colors have become the fastest growing segment of caramel colorants, as they meet consumer demand for cleaner labels on foods and beverages. For example, while the world's largest retailer of natural foods recently disclosed that, "caramel color is acceptable as a 'natural color,' " it also admitted that the company prefers Class I offerings because they are "minimally processed." At the beginning of last year, California Proposition 65 began enforcing the listing of 4 Methylimidazole (4MeI) as a possible carcinogen in caramel color. Sethness reports that his company spent more than four years developing low-4MeI alternatives for its Class III and Class IV liquid and powdered caramel colors. In order to comply with Prop 65, many companies in the cola and baking industries have incorporated low-4MeI Caramel colors into their formulations. Sethness expects the demand for low-4MeI caramel colors to continue to increase. Despite the failure last November of California's Proposition 37, which would have mandated labeling of genetically engineered foods in the state, many state legislatures are considering legislation to require labeling of genetically engineered foods and ingredients. Sethness intends to closely monitor these states in 2013. If individual states begin mandating GMO labeling, then consumer demand for sucrose-based caramel colors would probably increase substantially, he says. Unfortunately, sucrose-based caramel colors generally have a higher cost and a shorter shelf life. Winston Boyd, Ph.D., is a color scientist, food technologist and vice president and chief chemist for Lawrence Foods Inc., Elk Grove Village, Ill. He can be reached at colordoc@execpc.com. Sensient Colors LLC notes a trend of expanding health and wellness perception in existing brands, rather than creating new ones, says Cory Gegg, marketing manager for the St. Louis-based company. Healthy indulgences and all-natural products are continuing trends, and for many formulations natural colors are fundamental in achieving this goal. Although the shade depends on the individual company and its overall marketing objectives, Sensient expects that the incorporation of natural colors into processed foods will only increase. In responding to market trends, the company has developed a low-calorie natural colorants line to satisfy those twin demands for "naturalness" and reduced-calorie products. New formulations in sugar-based dispersions, liquids and powders have led to a complete library of low-calorie natural colors. An extensive research and stability testing program ensures color performance and quality. Consumer interest and demand for clean-label declarations will remain. Versatile natural colorants, such as tomato-based colorants that modern technology has opened up for use as every shade from yellow or orange shade to a vivid red have brought processors the freedom to fulfill this demand. Moreover, although such fruit and vegetable-derived colorants contain nutraceutical compounds in trace amounts, such as vitamin A as beta-carotene from tomato-derived color, it still provides marketing appeal.